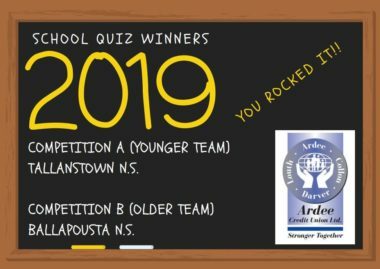 The Ardee Credit Union heat of the 2019 National Quiz for Primary School Pupils was held on Monday 4th February in the Bohemian Centre. Quizmaster for the occasion was Mr Tommy Kirk. The competition was an extremely enjoyable one with Tallanstown National School taking the honours in Competition A and Ballapousta National School winners in Competition B. Scoil Mhuire and Drumconrath were runners up. Tallanstown N.S. and Ballapousta N.S. will now represent Ardee Credit Union in the Chapter Final to be held on 3rd March 2019 in the Glencarn Hotel, Castleblayney, Co Monaghan. At Chapter level the teams will compete against other winning teams from Counties Louth, Cavan and Monaghan.